Ok, so the title might be a bold statement, but I’ve been hearing a lot about a mind management theory which is helping high profile people control and maximize their performance. Dr Steve Peters has worked with people like Team GB’s cycling team, Ronnie O’Sullivan and (most importantly) Liverpool FC and whilst he’s not likely to share the secrets of his work with them, he does share his simple theory in his book, The Chimp Paradox: the Mind Management programme for confidence, success and happiness. The theory goes that our brains are made up of different components which behave (and cause us to behave) in particular ways. Nothing new there, but Dr Peters sets this out in a funny way which is so easy to relate to, it’s easy to see your own brain behaving in the same way. 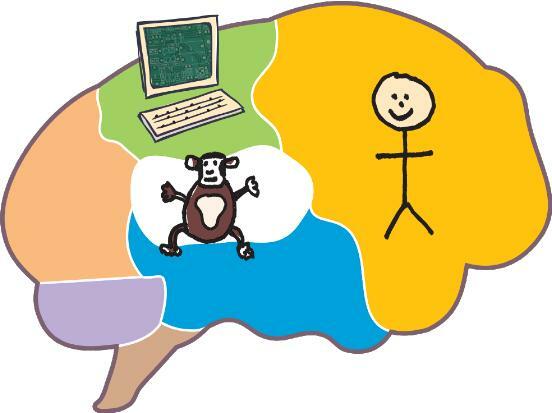 The Chimp (aka your limbic system): this is the emotional, primal part of your brain responsible for keeping you alive, should you happen to be born in caveman days. It can indepently make decisions for you based on emotional information, feelings and impressions. These might be good or they might be bad. Either way, you rely on your little chimp making good decisions quickly because it thinks much quicker than the human. The human (aka your dorsolateral prefrontal cortex): this is the civilised part of your brain which is essentially you. You think sensibly and use facts to base your decisions on. You also enjoy having dreams for your future so you think long term. The Computer: this stores your beliefs, experiences and information which both your chimp and human input into and take information from. Having a well run computer is crucial to controlling that chimp. Also featuring: gremlins, goblins & auto pilots – ideas or behaviours which are either already within your computer or can be placed there (in both a helpful and unhelpful way). The stone of life also features and is the reference point for all parts of your brain giving a benchmark to your behaviour. Critical to who you are as a person. Now whilst Dr Peters doesn’t suggest that the chimp is a bad thing all the time, it’s not necessarily built to help you get through modern life. Office politics would certainly go up a notch if we all worked out whose turn it is to make tea by screeching and wrestling. The chimp is permanently on high alert for danger, looking out for threats and anything that you might need to get the hell away from. When old chimpy does sense danger, it can get aggressive in a bid to protect you. Ever flown into a sweary rage because someone cut you up on the road? There is absolutely no logical benefit to you from that crazy rage and yet you still have this very strong emotional response. Yep, that’s your chimp letting loose. Feeling blind terror at the thought of a job interview? Thinking it’s probably best to just not turn up? That’s your chimp getting all confused and het up that you might actually die in that interview chair. Clearly unlikely and unhelpful to the logical human you who is trying to chase the long term goal of career success. Your slower thinking and unfortunately less powerful ‘human’ doesn’t get a look in until the chimp has calmed down or tired himself out. Dr Peter’s mind management programme sets out how you can use strategies for your computer to keep your chimp under control, giving your human a fairer shot at controlling what you’re doing and very importantly, how you are feeling. Even though it has plenty of funny scenarios, which most people will relate to, there is a serious practical purpose to the book. It is a particularly interesting read if you ever lose your temper, worry about what others think, regularly become stressed, beat yourself up about little things…the list goes on. Well worth a read. I always love to read your comments – let me know if you’ve read this or have tried anything similar. It would be great to know what has helped you!